Story by Milli Thornton. Photos Copyright © Milli Thornton & Steve Nazelrod. IN A PERFECT WORLD, and for continuity’s sake, this post would have come less than a week after my Goodbye, Ohio story, consecutively showing the place we left behind (Youngstown, Ohio) and the old, familiar place we’ve just moved back to (Taos, New Mexico). However, accommodation challenges have meant that, two weeks after driving into NM with our chock-full Penske truck, we still haven’t moved into our new place. We’ve done the motel thing (meh) and now we’re staying with a friend until our rental house is dewinterized. I finally got organized and took some photos for you here in Taos. But first . . . do you like the feature photo of me on the border of Colorado and New Mexico doing the Vanna White hand flutters under the “Welcome to New Mexico” sign? I had fantasized about capturing that exact scene and our friend Steve (who valiantly drove the moving van for us) complied beautifully. 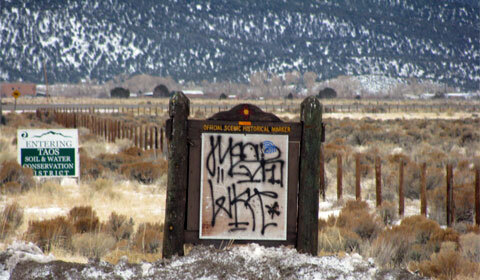 During the same roadside stop, Steve took this picture of an Official Scenic Historical Marker covered in graffiti. Very New Mexico. 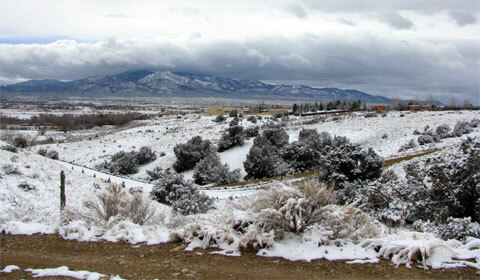 Future posts will feature the many moods of Taos Mountain, as well as addressing the question of whether the mountain can spit you out (yep, you read that right). But for now let’s focus in the opposite direction: towards Picuris Mountain seen at the south end of town. My husband Brian has made many journeys up Picuris to apply his engineering skills to the solar panels and transmitting equipment for solar radio station KTAOS. 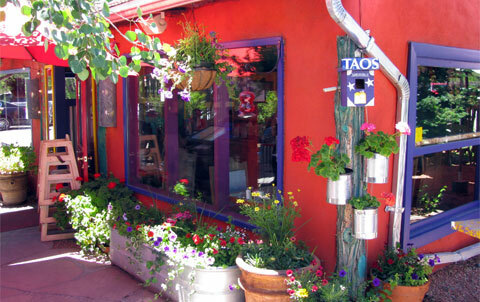 You can’t talk about Taos without mentioning the restaurants and the cuisine. We’ve been revisiting old haunts (and mourning the loss of certain restaurants) and today we had a late breakfast at Michael’s Kitchen, which hit a spot that can only be fulfilled at Michael’s. Comfort food, great roasted green or red chile for your burrito or omelette and the same staff that have been there for years. Milli Thornton (aka Milliver) is the author of Fear of Writing . . . putting the fun back into writing!. She is owner of the Fear of Writing Online Course and Unleash Your Writing!, where her mission is to put the fun back into writing. Milli blogs at Screenwriting in the Boonies, hosts 10K Day for Writers and coaches writers at Writer’s Muse. I’ve only made glancing trips through New Mexico on our way to/from Colorado when we lived there, so I’ll be looking forward to your posts! Although, it makes me a little sad that you’re so much farther away from Maine…I will hope to visit the southwest soon (I am absolutely ecstatic thinking about Orlando’s Los Colores! YUM!! Congrats on the move, and hope you get settled in soon! Saying that you’ll be looking forward to my NM posts whets my appetite even MORE to write about/photograph this gorgeous place. And, Julia, if you DO plan a trip to the Southwest, please let me know. I would love to have you as my guest! Great intro to NM! I have only gone through NM on a train going to Cal. So your articles will enlighten me to the area. It looks beautiful in your photos!.. I am looking forward to them all. So glad you made the trip safely and Hope you can get settled in ASAP! Glad you liked the intro to NM. More to come! Yes, definitely looking forward to more NM articles, glad you’ll be making up for lost time! Estrella, so glad you liked my photo of Picuris. Hiking it would require me to be mega-light years fitter than I am now. 😀 Brian said he did it once (from about 1/3 of the way up) — that was when he was young and fit and even then he didn’t reach the peak to pitch his tent until nightfall. But I’ve been up there with Brian by 4-wheel drive and the view from the top is AMAZING. P.S. Did you capture any gardens with your lens when you were here? 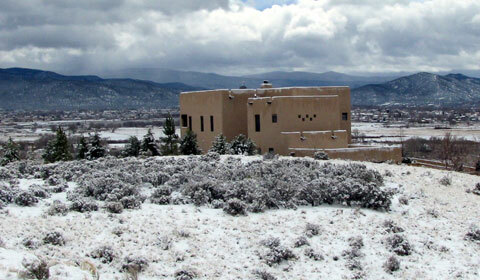 I lived in NM as a child, but never got to Taos. 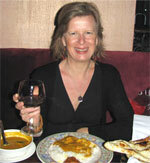 I’ve heard it is a true gem of the Enchantment State and I can’t wait to hear more…..especially the restaurants! You may have told me already but please refresh my memory. Where in NM did you live as a child? I’m so curious. So glad to hear that you made it to New Mexico safe and sound. My husband lived in Albuquerque, NM for many, many years. It is where he feels he is from (his father was in the Army while my husband was young). Every once in a while, my spouse gets a hankerin’ (when talking about the southwest, one must always use the word, hankerin’) for green chile. Now I have a source!! I have never been to Taos but it’s on my list. Keep the letters and cards coming!! Cathie, I can definitely be your woman-on-the-ground for shipments of green chile when you need them. Our friend Steve, mentioned in this post, kept us supplied while we lived in OH. I’m so selfishly happy to have Milli and Brian back in New Mexico. Yes, Vanna, it looks like you just turned each letter of the “Welcome to New Mexico” sign. Do I win the trip to St. Croix? A lot has changed but the world feels a bit more “right” with my friends back in town. Milli was my very first friend in Taos. It was love at first sight when we worked together back in 1998! 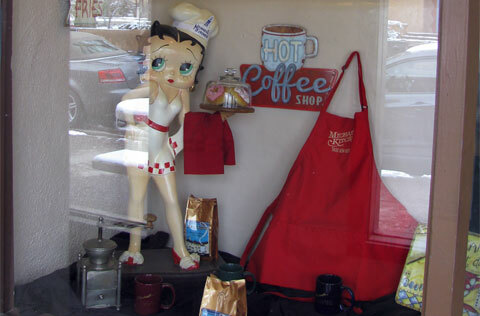 I, too mourn the loss of places like The Burrito Wagon (#7, chicken burrito with green chile, sour cream and avocado, I salute you), Fred’s, The Apple Tree, Amigos Co-op, Ranchos Coffee Company (the scene of so much fun writing and coffee drinking! ), and The Bean. When we had that fun lunch together that summer at Orlando’s, I never dreamed you were really moving back to Taos. Saints be praised. Los Colores is nice, but what about Los Primos: Chile relleno, pork tamale, Navidad, beans, posole and a warm tortilla. Que Viva Taos. Thank you for listing those old favorites that we still mourn among the restaurant greats of Taos. To think of Lambert’s being where the Apple Tree used to be Just Isn’t Right.